This one is something NEW from the Truly Rich Club. Warning: This will be the first and last I am going to share an interview like this from the club. If you want more and future interviews, then you should join the Truly Rich Club, Now. 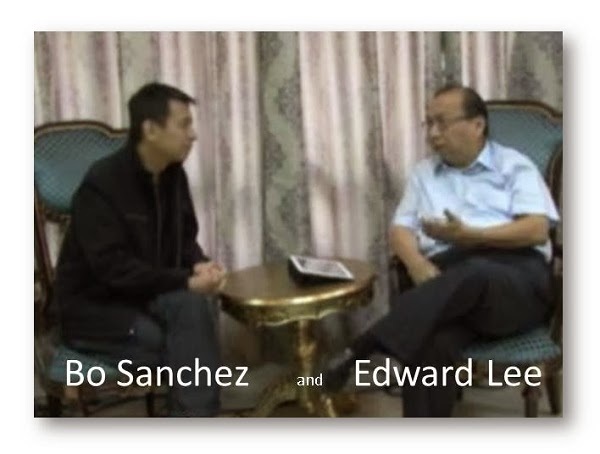 Here's the interview transcript of brother Bo Sanchez with COL Chairman Edward Lee. Let's read and learn from them. Bo: Hi everybody! This is Bo Sanchez of the Truly Rich Club. I know a lot of people are asking about the stock market. So we will do this regularly, every single month. We will pick the brains of my mentor, our mentor, Chairman Edward Lee. He’s someone who’s been in the stock market for 30+ years. And with that incredible experience, he will give you that wisdom.We’ve been receiving questions from TrulyRichClub members and they’ve been asking the question, “Am I doing something wrong? Why is my portfolio all negative? Why is it all red?” And so we’re going to get the answer from the man himself, Edward Lee. Bo: I think what happens Edward is that sometimes they question, am I doing something wrong, or is the system wrong. emerging market, you’re talking 14-15 percent growth every year, much, much better than your regular 1 to 2 percent interest rates. Edward: Compared to inflation. So they have to stick to it. That’s why it’s called a program, an investment program, that they continue to deploy and the best is to buy all these good companies with dividends and reinvest these dividends to the stocks. We think that because of the K Trade in the U.S.
Bo: You have to discuss about that because somebody was asking me a very good question. She said, “The stocks went down even before Yolanda. 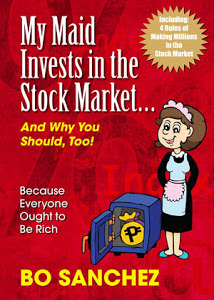 People are saying Yolanda is the one that made the stock market go down.” So please explain why the stock market went down even before Yolanda. Edward: Before the talk of this tapering, what happened was the 10-year U.S. Treasury started moving up from 1.6 to 1.8 percent. Today it’s around 2.7-2.8 percent. This is a long-term treasury bill as compared to the short (the short has not moved). What happened is that the Philippines’ 10-year is about 3.3-3.5 percent today. In comparing with the U.S. which is 2.7-2.8 percent, there is really no more meat for people. So what happen is that the money flows out from the emerging market going back to the developed market because of the long-term interest rate which has moved from 1.6 to almost 3 percent today. Bo: So what you’re saying Edward, just to simplify for people who don’t have this background—that includes me—is that foreign funds that were invested in the stock market because of that change in the increase of the 10-year Treasury in the United States, they started pulling out their money from our stock market. So that’s why we have this depressed stock market. Edward: Yes. Yolanda is just an excuse for us here in the Philippines. But for the U.S. fund managers, they’ve been selling even prior to Yolanda. Now, please TRC members must understand, the drop is not only in the Philippines. It includes Indonesia, it includes Thailand. So it cannot be Yolanda. Yolanda is just for Filipinos to basically get scared. Bo: So that’s bad news in a sense that foreign funds have left the Philippine Stock Market but it’s good news for you, for me, because we’re long-term investors. And what Edward is saying, take the opportunity. Every month, we follow a program. It’s called Strategic Averaging Method (SAM) and every month you’re supposed to buy. So when your whole portfolio is red, it’s good because we’re long-term. Edward: What is really key here is that the emotional cycle investing is always in play. So when prices go down, people start doubting. Maybe they’re doing something wrong. But what they don’t understand this is part of the investment promo for the long-term and for short-term, it always go through this volatility. That’s one of the reasons why we always make the comment of Peter Lynch that for the short-term, there is really no correlation. Meaning success of the companies’ performance and success of the performance of the stocks are not correlated. But long-term, it’s a 100 percent correlation based on earnings, earnings, earnings. As this company continues to generate more earning moving forward then it’s just temporary pullback, set back, but for us, it is the best time for us to continue to deploy. I think what we need to tell them is that the maximum really is only 20 percent of their savings that goes into stock market investing. Because if they do more than that, they will really get scared. They will have their stomach ache and they will probably sell at the bottom. Edward: Well, the sad part about this is that we have an earning’s peak. We have the highest earning for the Philippine Composite Index in 2013 and the problem is that by 2014, you will have a single earnings growth. Meaning, the estimate is about 6.5 to 7 percent in terms of earnings of EPS growth for the Philippine Composite Index. Because of that we believe that the market will just continue sideways for about a year, nine months to a year. That’s supposed to be good for us because when we have the sideways environment, whatever we’re deploying today, we will have a lot of time to deploy further because we believe by 2015—because this year is a high based and next year will be a low base—so going to 2015, we will go back to the double digit earnings growth. So 2015 should be the best year but you need to accumulate this time. Bo: So that’s it. From our great mentor, Edward Lee. You know we’re foreseeing a sideways movement for December and for one whole year which is fantastic for all of us because that means you have to keep on buying every single month. And then, I want you to go to your friends, your family, now is the time to start investing because by 2015, the stock market will start going up. That’s our projection, that’s the projection of Edward. So they’ve got to accumulate now and then we’ll be all smiling after all this sideways movement. So there you have it. The interview of Truly Rich Club founder, Bo Sanchez to Sir Edward Lee, the founder of COL financial. To get their future insights about the stock market in the Philippines, you can join or subscribe and be part of the Truly Rich Club.